Yummy, Low Calorie Diet Food -- Plus Where to Buy! : Another Yummy Cereal for Breakfast (or Snack)! Another Yummy Cereal for Breakfast (or Snack)! There are two reasons why I love cereal. The first reason is that I think it makes for a super yummy, healthy, and filling breakfast (or even lunch sometimes) when combined with low calorie almond milk and some frozen fruit or frozen bananas (for only 3-4 WW points depending on which cereal variety you pick). Secondly, I love it because it makes a great (and crunchy!) 2 WW point snack -- and there are so many different healthy varieties of cereal on the market that it never gets old! I blogged previously about low calorie Kashi -- my favorite one point cereal, which I eat all the time. But today, I thought I'd introduce my favorite 2 point cereal flavors, for those times when you want a snack or are willing to spend an extra point (or eat some extra calories) for something a bit more sweet (but still healthy). 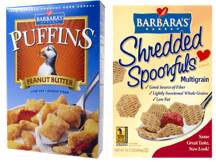 I've been a HUGE fan of Barbara's Bakery cereals for years now. Barbara's multi-grain Shredded Spoonfuls, are delicious (and sweet!) and are full of smart ingredients. For instance, they are packed with protein and fiber, and contain no artificial sweeteners, unlike many other low calorie cereals (such as Fiber One which contains aspartame). I also love Barbara's Peanut Butter Puffins, which taste so good, I sometimes find it difficult to believe that they are good for me! Puffins are just what you'd expect from the name -- puffed cereal pillows, with a sweet tasty shell and air in the middle. Puffins come in 3 additional yummy flavors, including Cinnamon (only 1 WW Point, and cinnamon was featured as a earlier in the 11 Best Foods You Should Eat blog posting), Honey Rice (sweetened with honey and 2 WW Points), and Original (1 WW Point). I often weigh out a portion of Puffins on my food scale, and put them in a plastic bag for a yummy, crunchy to-go snack that I can pick at throughout the day. You can buy Barbara's Shredded Spoonfulls at Trader Joes or Whole Foods. Barbara's Puffins are available at Whole Foods. A great cereal to try is the Organic Morning Lite from Trader Joe's. 1 cup w/Almond Breeze = 170 calories:P! Sounds great. I will check it out! The lowest calorie cereal is just the ValueTime Crisped Rice, basically cheap Rice Krispies and for a cup and a half plus some skim milk still only 170 calories!